We're adding new tools as we learn about them, and you'll find helpful replies and information from the companies listed here embedded in the full list at the end of the post. You may also want to check out our all-encompassing post on making decisions in meetings -- it's a great companion piece to this article. How exactly do you do this online? 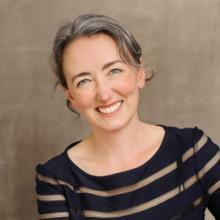 The Strategic Planning Meeting Essentials Pack designed by Anna O'Byrne includes a series of online brainstorming and decision-making exercises. If you run these meetings face-to-face, you'll use sticky notes, markers and a whiteboard for those steps in the process. But, how do you do the sticky-note thing online? You can find dozens of online sticky note and brainstorming applications, but not all of them work well as part of an online meeting. 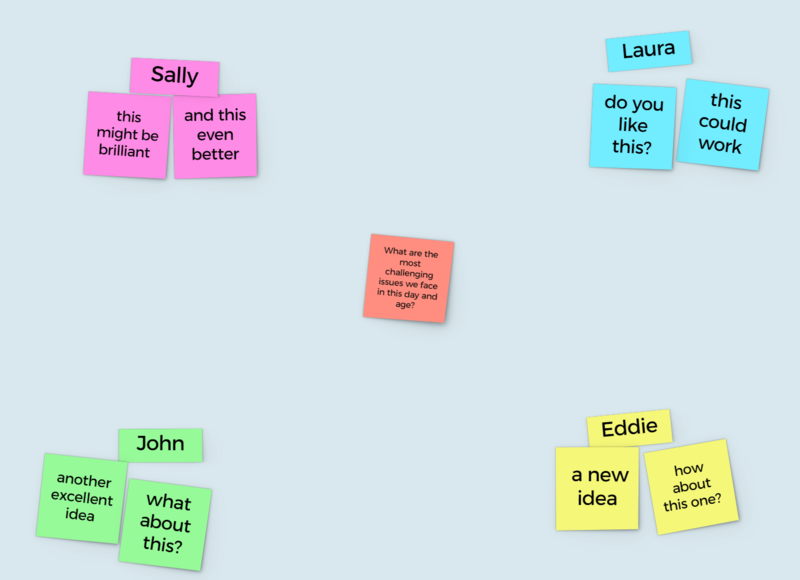 We decided to test out all the online sticky-note, brainstorming, and decision-making tools we could find to figure out just which ones work best for quick collaborative sessions during a meeting. Alert! This is a MEGA POST. To prevent wrist strain brought on by too much scrolling, we offer this table of contents. Just as there are lots of ways to use real sticky notes, there are lots of ways to use online sticky note tools. Right now, we want to find those that work best as part of a real-time meeting. First, we scoured the internet for all the online meeting tools we could find that seemed like they might work. We searched for brainstorming tools, tools used in agile retrospectives, “online sticky notes”, decision support software, and more. Our original list contained over 50 different products. Then, we began signing up for free trials and running each product through our test use case (described below). We quickly decided to cut all the simple virtual whiteboards and the mind mapping tools from the list, as they just weren't meant to support the kind of process we need for our meetings. We also cut any product recently acquired by another company, those products that were too buggy for our test, and those that we couldn't figure out. Our final list includes 27 tools. Our test was based on a technique known as the KJ-Method. While you may not know it by that name, you've probably been in a meeting that used it, because it's simple and it's really handy any time you need a group to quickly sort through a bunch of ideas. 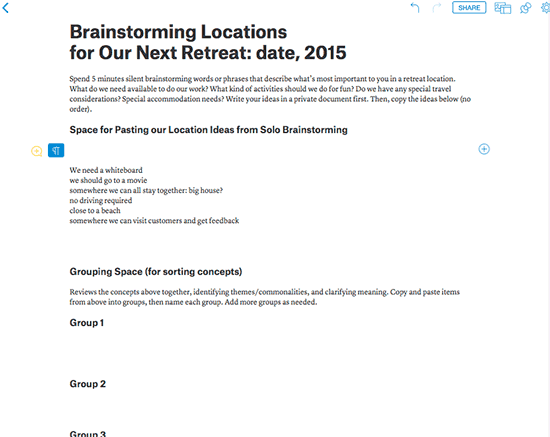 What should we look for when planning our next company retreat? Everyone spends 3 silent minutes writing down their ideas. Each idea goes on a separate note. Similar processes ask a team to prioritize each concept against pre-determined criteria, such as importance and urgency, then select the ideas that rank the highest. The strategic planning templates call for ranking ideas like that when planning goals and strategies, so we looked for tools that could support that too. All of this is easy enough with sticky notes and markers - but a bit tricky online! Obviously the tools we recommend would have to support the process (many don't). Beyond that, we were seeking tools that met as many of these criteria as possible. We're after something a team can use regularly. Something developers can use in retrospectives, executives can use to plan, and sales can use to explore requirements with prospects. This means it has to be super easy to set up a new session. Also, anything you ask a team to try in front of each other needs to be easy to figure out. If it's confusing, people will get frustrated and embarrassed, and that's no good for your meeting. None of the products we explored had support for team audio or video, so we're assuming you'll also be running online meeting software at the same time. There needed to be a way to put a simple link in the meeting that everyone could just click to access the brainstorming tool, or some other really easy way to get everyone connected on-the-fly. Techniques like the KJ-Method naturally engage everyone in the meeting. When you're together, it's very obvious if someone isn't enjoying the process or simply isn't participating. We wanted to find something that encouraged this kind of energy and transparency in an online setting. Techniques using sticky notes in face-to-face meetings get everyone involved. 4. A way to export the results; no copy and paste! When you use real sticky notes, someone has to type up the big ideas afterwards. Right now, we're focused on strategic planning, so we definitely want to put the ideas from our brainstorm to use! Since you type your ideas into these tools in the first place, it seemed like it should be a no-brainer to get them out again. Shockingly, not so. Most effective working sessions in the business world involve 3 to 10 people meeting for less than 2 hours. We wanted to find something that worked well at this scale. Some of the products we found were clearly intended for individual use, and others optimize for big conference events with hundreds or even thousands of participants; not what we're after. When you brainstorm, you want to get everyone's ideas in the conversation. At Lucid, we strive to make our software work for people with disabilities who may use assistive technologies, and for those joining on phones or other devices. We're far from perfect here, but it's a goal, and one we'd hoped to find shared by any brainstorming tool we'd recommend. Sadly, with one very qualified exception, this was not to be. Our list currently includes 27 tools, which we've grouped into several sub-categories. We'll explore each category in turn, explaining how to run the sample process using those tools and screenshots of our favorites. Then, we'll list our top picks and details about the full list of products we tested at the end of the post. Collaborative document editors let teams write documents together in real time. These tools aren't intended for brainstorming specifically, and they don't have anything that really looks like a sticky-note, so we were surprised at how well they worked in our test. 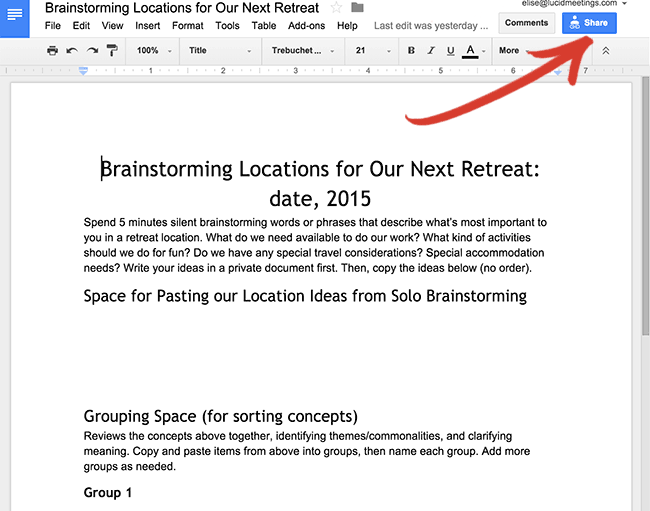 Anna taught us how to use Google Docs for brainstorming, and it works pretty well with a bit of advanced set up. These steps would be the same for the other products in this category. Before the meeting, create a new document with headings for each of the steps in your process. Screenshot: Use headings for each step of the process, and leave space for people to type. 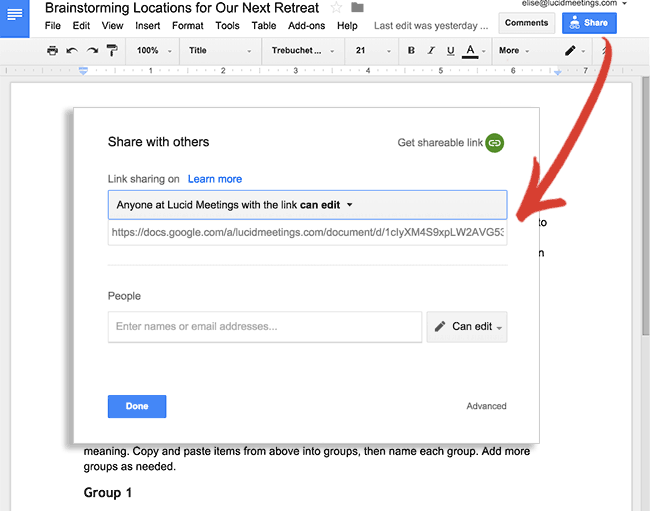 Get a link to the document you can paste into your meeting. For example, here's a view-only link to our sample document. Screenshot: Set your sharing so anyone with the link can edit the document. When it's time to brainstorm, ask everyone to first type their ideas in a separate document. Then, they'll paste these ideas under the first heading. You'll need a separate timer for this part. We use the one built into Lucid. To group ideas, copy and paste them into new sections. Add a new heading for each group. 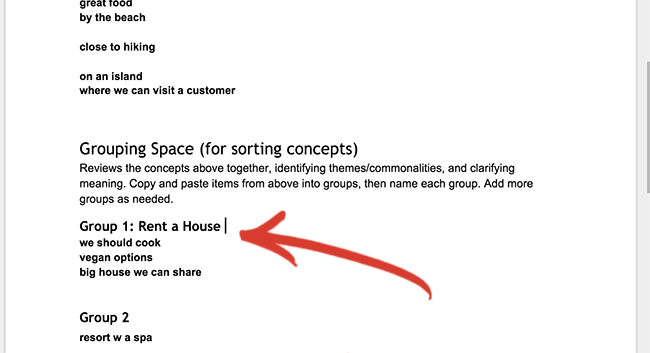 Screenshot: Everyone can copy and paste ideas into groups. Then, decide how many votes each person gets. Each person types an X next to a heading to mark their vote. Screenshot: If each person uses a different color, it makes it easier to see when all the votes are in. Count up the Xs to determine the winning themes. Renting a house wins! So, what did we like about using collaborative editors, and what were the drawbacks? Pretty easy to use. Most people understand how to type in a document, and how to copy and paste. You get an instantly useable result. The outcome of your brainstorming session is literally documented in the... well, in the document. This is the most accessible option. Perhaps the only accessible option, really. Microsoft, Google Docs and Etherpad have all put effort into supporting people using assistive technologies. No guidance; you have to figure it all out for yourself. Some tools in other categories will walk a team through the process, but here you're on your own. Invitations can be awkward. Something like Google Docs can be great for a team, but tricky when you work with a client who doesn't use a Google account at work. To avoid this, you can either make your document public (so people don't need to log in to edit it) or use an open tool like Etherpad. Doesn't scale: This process worked pretty well when we tested it with just 5 or 6 collaborators. When we involve more people all editing at the same time, though, it's a touch insane. Very 1000 monkeys with a typewriter. When you consider that these are tools people use primarily to write documents it makes sense; that's not exactly the kind of activity that works best with 10+ folks all editing at the same time. It's just not as cool. When you do a sticky-note exercise in person, the group gets energy from moving around and working with all the color. We found the tools that replicate some of this movement and color online to be more engaging. Brainstorming in a document mostly feels like work. Collaborative editors are a solid choice when working with a small team and you know how to set up and lead the exercise you're using. These were the only really easy option for teams with accessibility requirements. When you imagine what an online sticky-notes tool might look like, you're picturing one of these. Yellow, green and pink squares with writing on them, “pinned” to a board with, yes, a cork-inspired background image. Teams can add items all at once, and click to drag the notes around. The dividing line between simple sticky notes and virtual design spaces (also featuring sticky-note-esque boxes) is a soft blurry one. We've separated the groups based on how we'd use each tool - your mileage might vary. Create a new board before the meeting. Get the link to your board and paste it into your meeting. When it's time to brainstorm, ask everyone to first type their ideas in a separate document. Then, take turns creating one note for each idea. 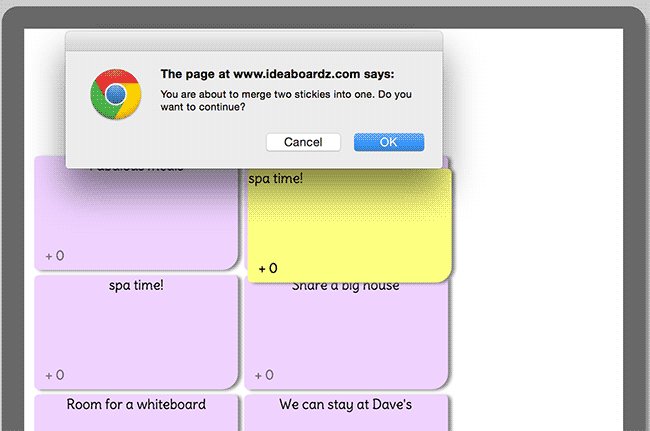 Screenshot: You drag stickies from the left onto the board, then click to edit them. To group similar ideas, either just drag them on top of each other in layers, or draw a box around them to create a group. Stickies within the box can be moved around together, and you can add a label for the group. Screenshot: Here we just grouped ideas by lumping them, and added a little sticky for the header. Once you have your groups set, ask everyone to vote for their favorites. You could do this by adding Xs to the text, or happy face stickers! While IdeaFlip doesn't have an explicit voting feature, the friendly stickers make a nice alternative. Screenshot: From our first test, showing the stickers in action. Figure out which concepts win by counting up x's/happy faces. Export the board. You can export a IdeaFlip to PDF, PNG, or CSV, or Excel but some of these tools don't have an export, so you may need to copy and paste anything important from your sticky notes. Simple is as simple does. These products are all pretty easy to use for short sessions. They don't have a lot of extra features that might confuse people, and the interactions are all basically point-n-click. Great for the literal thinkers in the group. 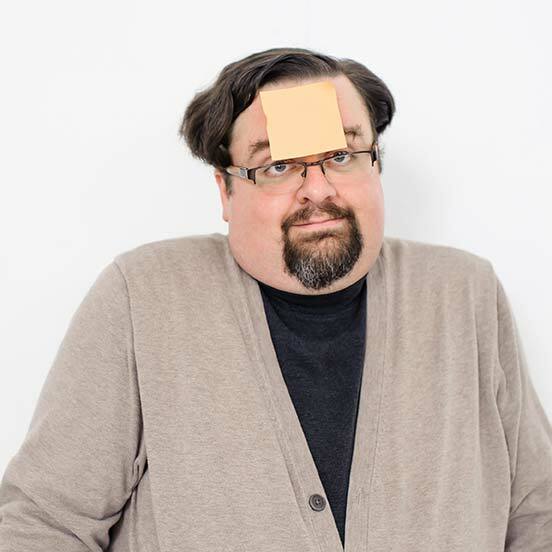 I know I've personally been asked at least 9,000 times for how to do “sticky notes online” by someone working to run an agile retrospective with a remote team. If you or someone you know has a super strong idea of how to run a meeting using sticky notes, this very literal approach will make them comfortable. Kind of fun. All the bright colors and happy add-ons, with stickers and videos and such, make these products fun to use with a casual audience. Mostly free or inexpensive and embeddable. Some tools in this list don't even ask you to sign up before you create a board. All of them have easy links you can share with collaborators, and many can even be embedded directly into a shared webpage. Many feel technically immature. A lot of these tools were clearly started as side projects, and can be a little buggy. They're mostly free, so given the price, you may find the occasional glitch a non-issue. June 2017 Update: IdeaFlip has come along since we originally posted this article. They now have more robust support for the session leader and a stand-alone version appropriate for use behind corporate firewalls. Seriously inaccessible. There is A LOT of drag and drop used here, and keyboard controls come few and far between. And let's not even get started on the semantics! Gets unusable when there's too much going on. These tools work best with either only a few people, or only a handful of ideas in flight at once. When you try to have more than 5 people working on lots of ideas at once, it becomes quickly impossible to see what's going on. Notes flip on top of notes, colors change out, you lose the item you were working on… Chaos! 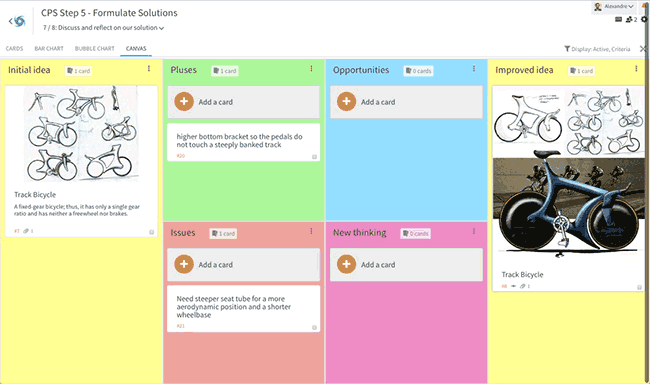 These online sticky notes tools look like they're designed for personal use, and some may even be good for helping small teams create visual task boards. But for any team trying to brainstorm and prioritize ideas at scale, we'd suggest using a different type of tool. These products have more process support than simple sticky-note tools, but not as much as the decision support products we'll discuss in the next section. Designed by software and web developers for software and web developers, these products do a great job supporting the collaboration processes used in agile development meetings. Create a new board before the meeting. You can start with predefined columns, but for our example, we'll just use a simple blank space. 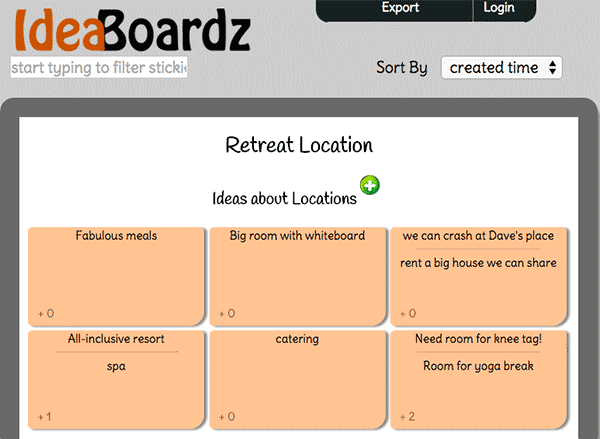 Screenshot: Create a new board right from the home page for free. 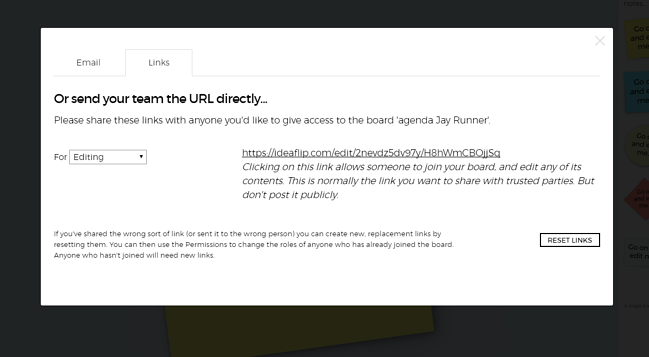 Get the link to your board from your browser and paste it into your meeting. Screenshot: Click the plus. New stickies open up below existing ones for you to type in. 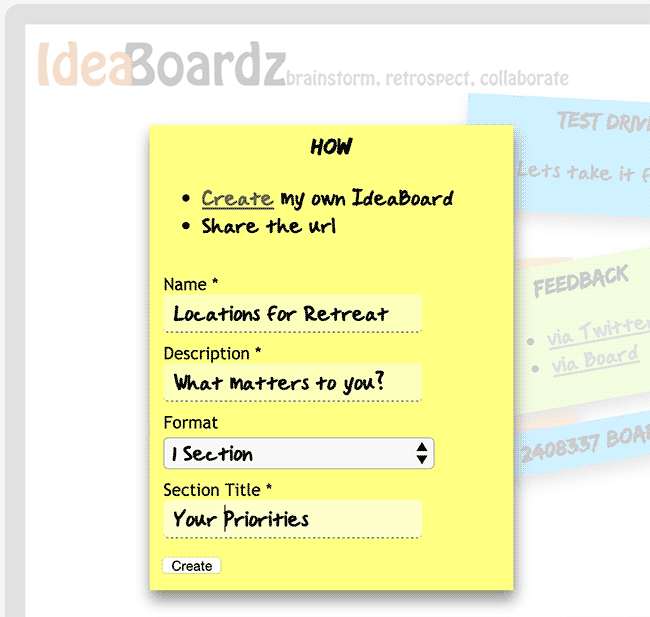 In IdeaBoardz, you can group ideas by dragging them on top of each other to combine them. Screenshot: You get several confirmation pop-ups here. Very safe, a bit slow. Once you have your groups set, ask everyone to vote for their favorites. In IdeaBoardz, you can give each card a “thumbs up”. Screenshot: Clicking the card reveals the voting "thumbs up" and a place where you can edit the card content. Use the vote count shown at the bottom of each card to see which ones win. Screenshot: The voting for our first test. Note the orange. Apparently you get a new color for each board? Export the board to PDF (the Excel export is wonky here). Explicit support for grouping and voting on ideas. When you get to the voting step, it's really helpful to have an easy way to cast a vote and have those votes counted. Free or inexpensive. You can quickly get a sense for these products to see if they work for your group, without risking your budget. Light-weight. You won't find a lot of extra features that get in your way here. Limited templates or guidance. These products were designed with specific processes in mind, and they assume the people using the product already know how to work the process. April 2016 Update: Retrium has grown quite a bit since the original review, and now supports more workflows. They speak developer-ese. And if you're a developer, that's actually a good thing. In Boardthing, you literally use HTML tags to format information on your card. Crazy powerful for people who code; limiting for those who don't. For development and design teams collaborating on internal projects, these products provide an excellent combination of simple process support, low cost, and no-fuss customization. For the non-technical folks or those working with people outside your team, collaborative documents or decision support tools are a better choice. The virtual meeting tools in this category explicitly support processes like the one we're trying to test, and many other related group techniques too. Most include built-in templates that walk the group through each step, and all of them generate detailed reports. That said, tools in this category aren't right for everyone. Not all of the tools in this category have a free trial, but GroupMap does, so we'll use that for our example. Before the meeting, select a starting template and adjust the settings to fit your meeting. Screenshot: You can adjust the colors, steps, labels, and other features of each map. Paste the link to your GroupMap into your agenda. 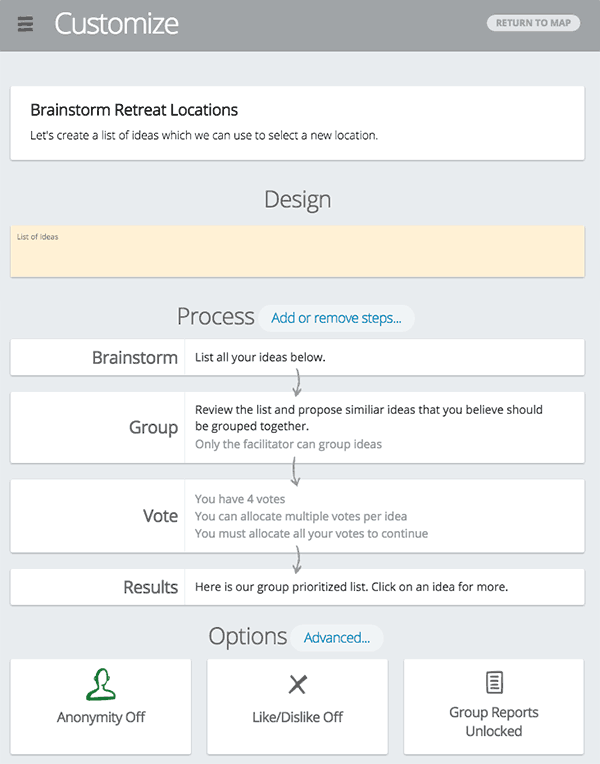 When it's time to brainstorm, instruct everyone to join the GroupMap and begin adding ideas. When you use a tool like this, you don't have to type ideas in a separate document first; the software can be set up so everyone's ideas are private until you're ready to go to the next step. 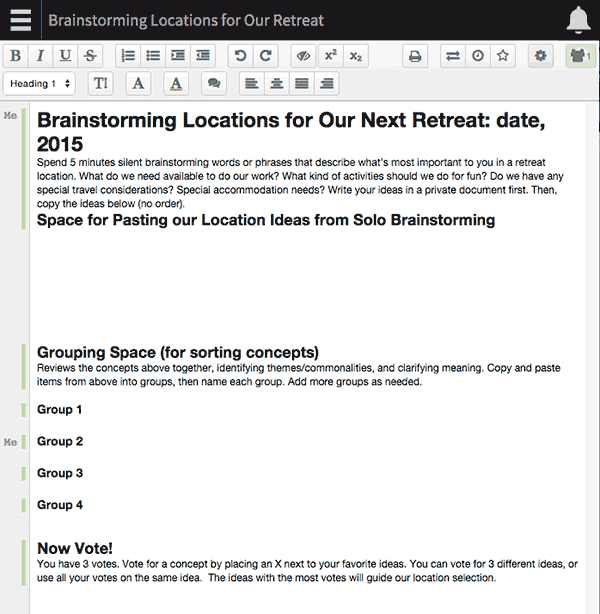 Screenshot: Each person gets their own place to add ideas. To group ideas, click to the “Group” step inGroupMap. You'll select several ideas by simply clicking on them.GroupMap will prompt you name each group. Once the groups look good, click to go to the “Vote” step, and vote away. The software takes care of handing out “dots” and letting you know which items win. Screenshot: Each person can use a pre-set number of votes, and the total is calculated in real time. When you're done, export your report. You can download your ideas as a prettyPDF, but you might find the Excel spreadsheet more useful. You have options! Screenshot: You get lots of reporting options with a tool like this. It's super obvious how to run the process. Tools in this category explicitly support this kind of activity. When you need to group ideas, you click on buttons with labels like “Group Ideas”. Voting and ranking features actually figure out how well each idea scored for you. And the built-in templates will teach you new ways to collaborate that you can use in other meetings. Usable for non-technical folks. Participants see simple boxes for entering ideas, and clear instructions at each step, which helps a lot when you meet with people who don't spend all day working online. Fabulous for brainstorming with executives! Excellent reporting. Each of these products supplies reports in several formats. You can get a shiny PDF overview, and download individual ideas to spreadsheets. Designed for the Enterprise. There aren't many free or even inexpensive options in this category. Turns out, the big companies and organizations take decision making very seriously, and they're willing to pay for this kind of support. The companies who make these products know that. This is not universally true for all these products and things change all the time, but as of today, most decision support software comes with a sales call and a contract. Learning curve included. Each of these products reflects their founding team's unique facilitation soul. They all use slightly different templates and slightly different terminology for the steps in a process. You will need to test out a few examples with friends before you pick a tool for keeps. These products give you the benefits of having a trained facilitator armed with packets of sticky-notes on staff. If you can afford it, learning to use a dedicated decision support tool can add a level of richness, engagement and effectiveness to your meetings that you can't achieve any other way. The products in this category work great for visual planning and management. Think of them as the digital equivalent of a war room, where the walls are covered in notes and drawings and pictures, all interconnected and evolving over the course of the work. Each note represents some concept or piece of work in progress. The notes fill out the “information radiator” - a big whiteboard where people can walk up and see the project status at a glance. At first blush, these tools sound pretty much the same as their simple sticky-notes relatives. But make no mistake - these are the city mice, with more sophisticated features, complicated options and higher expectations than their country cousins. If you wanted to run a real-time brainstorming session during a meeting using one of these tools, you could do so following the same steps we outlined for simple sticky note tools. 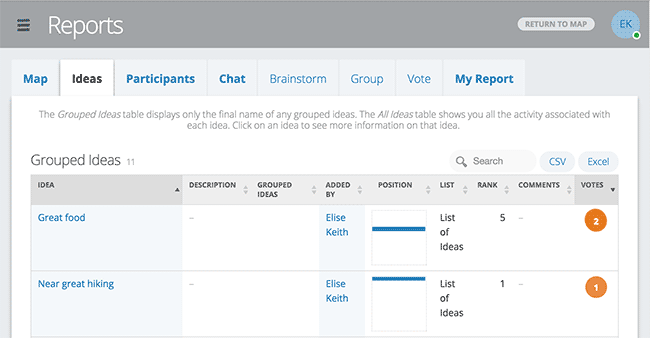 With a few exceptions: Mural.ly, Stormboard and iObeya include easy-to-use features for grouping ideas and voting. But really, you should look seriously at the products in this category only if you want a way to visually manage your work on an ongoing basis. These are all very cool products for visual management as a core part of your business. Anyone using a Lean manufacturing process, building a user experience map, or laying out a visual strategy will find these products useful. If you already use one of these visual management tools, you can also use it for quick brainstorming. But if you're looking for something specifically to support engagement during meetings, you'll have better results with a product purpose-built for brainstorming and decision support. After all that, here are the products that stood out from the crowd. We recommend adding one of these to your online meeting toolkit. We loved the ease of use, attractive design, clarity of the process, and excellent reporting provided by all three of our top recommendaitons. For teams and small organizations, both GroupMap and Stormz offer a free trial and a monthly subscription option. Occasional users probably won't experience big differences between these platforms. Both are easy to use and generate really useful results. Lucid Meetings customers should consider Stormz, using our integration to ensure the results from your brainstorming session get stored with your other meeting records. Powernoodle serves Enterprise customers, and is a great choice for those organizatons looking to improve their capacity for large scale engagement and quality decision making. Enterprises should evaluate all three platforms; each offers unique integration and power-user features that create distinct advantages for some settings. Brainstorming in a co-edited document worked better than we expected, and starting with a product everyone already knows how to use eradicated the learning curve time. These are also the only viable option for those of you with accessibility requirements. Finally, free is a very good price! These products support our test process and offer a good alternative to development teams. But they lack the flexibility, power and finesse of our top choices, and didn't provide the reports we were looking for. Recommended for designers and others managing work visually. Mural.ly and iObeya fully support our process as part of a larger, deluxe visual management platform. Neither platform is free nor lightweight, but both can be an excellent choice for teams who benefit from visual collaboration both during and outside of meetings. Decision support tool with a free trial, so you can try it yourself. Some templates included, and they offer customizable processes too. 1000Minds focuses on helping groups prioritize alternatives based on pre-determined criteria, rather than brainstorming, so we don't recommend them for facilitating free-form online meeting sessions. Definitely worth checking out if you're looking for decision support software, though. This screenshot from their website shows just one step in the decision making process. 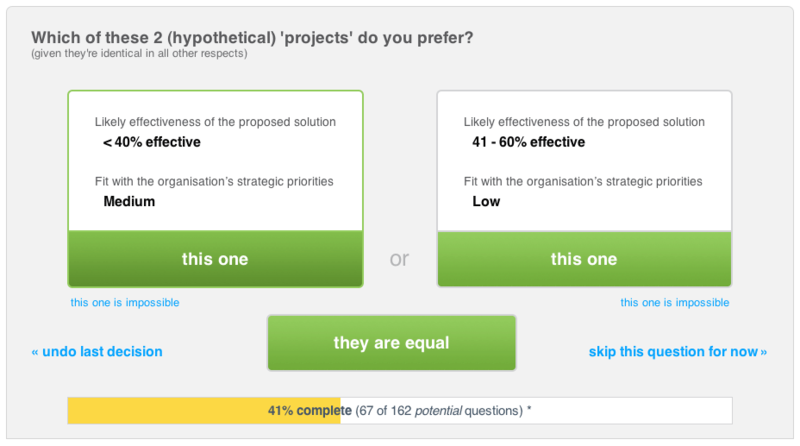 All that people would have to specify (and enter into 1000Minds by creating a “decision model” for this application) would be the criteria for the decision and the alternatives (locations) being considered; and then answer some trade-off questions in order to arrive at a ranking of the alternatives. That could be done in a meeting – e.g. in a single location; and indeed doing it as a group of people can be fun and good for team-building. In addition, it would be easy to apply some of our distributed group decision-making processes (see www.1000minds.com/solutions/group-decision-making-software ) to perform these activities in a distributed fashion (e.g. people in different locations; also ensuring privacy and anonymity, if desired). Create cards, add images, group cards, and dot vote in this online application from Dave Gray and the team behind Gamestorming. Boardthing received a major update in early 2017. They now offer a generous free trial and an affordable single-facilitator license. The updated version is easy to share with a group, fully supports the mechanics of the KJ technique, and includes exports in several formats. Behold the updated video tour. We continue to recommend Boardthing for web designers and developers for two reasons. First, on the plus side, Boardthing supports adding HTML directly to cards, which is a bonus feature these audiences can appreciate. The creators speak native web design, and web people will find this orientation useful. Secondly, Boardthing does not include pre-configured templates or system support for leading a group through distinct list, group, and voting steps. This provides design-oriented leaders the freedom to manage the process on the fly, but may not be adequate structure for larger groups who need clearer direction. It looks like sticky notes (cool! ), but sticky notes with purpose. CardBoard is specifically designed to help product teams map out customer journeys. They explain it all nicely in their demo video. Cardsmith is a new entrant in the visual management category. Cardsmith includes unique features that make it easy to organize cards in grids for planning, and to enrich each card with additional fields for capturing all kinds of planning details. Think of it like Excel + Sticky Notes. Alternatively you could create a Grid View on a Shared board and have all participant put their cards in a single column. You could suggest other participants "Hide" the other attendee’s columns to get them out of sight while doing their own individual brainstorming. If using individual Boards, the meeting moderator would now share a shared Board with everyone, and going around the ‘room’, have people move their cards into the Shared space while they discuss. Alternatively you could ‘unhide’ one participants Column or Row if using the Grid View on a Shared Board from the Start. I prefer the Freeform board for this however because it will allow for easier clustering/grouping of similar Cards later on. Using the Freeform Board, you would place similar Cards together. They can overlap slightly just like sticky notes. You can do this now using the honor system by having a number field on the face of the Card. Or you could put tick marks. Easy to use with minimal setup. I would give Cardsmith an A- here. It takes about 10 minutes to figure out how to use ALL of the Cardsmith features if you make use of our online tutorial videos. And once you know how to use it, it takes about 1 minute to setup a new Board for a meeting. You can add whatever fields you want to a Card (such as points, votes, notes). You can invite 10 people to a shared board by entering 10 email addresses (if they are not already users of Cardsmith). I’d give Cardsmith a C+ here. Cardsmith is truly real-time collaboration. It works like Google Docs. One person adds a card to a board, and everyone sees it immediately on their screens. Moving/dragging Cards is also seen real-time. Plus the lack of visual clutter and colorful options for Cards has shown to be quite engaging for teams. Each person could chose their favorite color to use in the Brainstorm. I’d give Cardsmith an A+ here. We have an export to .csv feature. And, more interestingly, you can easily move your brainstorming cards into a visual project plan or prioritized feature list, or some other type of Board for further action. I’d give Cardsmith an A here. Scaled to fit the working meeting. The 5 to 10 person sized team is exactly our audience. Inclusive of design and accessibility. We have not considered (yet) accessibility factors for visually impaired and such. We are sadly lacking here today. F.
Conceptboard provides a robust visual collaboration and management tool, ideally suited for marketing teams working with other departments and remote clients. If your team would benefit from using a tool like this as part of your core business process, you should also use it to run quick brainstorming sessions during meetings. If you only need support for meetings, though, see our recommendations above. Dropbox paper works very similarly to Quip and Google Docs when it comes to supporting our use case. This is a newer product and a good choice for teams that already use Dropbox. Screenshot: Look! I've got a lightbulb emoji right there. I think that's a delightful touch. Etherpad is an open-source collaborative document editor, and a good choice if you aren't already using Google Docs or Microsoft Word Live. Personally, I find it a bit faster and easier to use than either of the name-brand options, but you will need to either use this on a publicly hosted site (you can find several public instances here), or host it yourself. Here's a screenshot of our test setup. TIP: you can copy & paste this setup into your own document when you visit the public Google Doc linked below. Screenshot: Using a public Etherpad for brainstorming. Here's a sample Google Doc we set up for our test. Screenshot: Setting up Google Docs to share in our test. GroupMap directly supports every part of our test process with a simple, clean and easy-to-use interface. I recommend experimenting with the different templates before your first meeting, as each map-type works a bit differently. Screenshot: Three types of "Maps" in GroupMap. IdeaBoardz supports all the steps in our test process, which you would expect for a tool designed specifically for agile retrospectives. It was a little clunky to use (the animations rendered slowly for us at times), and I can't honestly endorse the use of that font, but it's free, simple, and does the job. Screenshot: IdeaBoardz had just the features we needed, and no more. 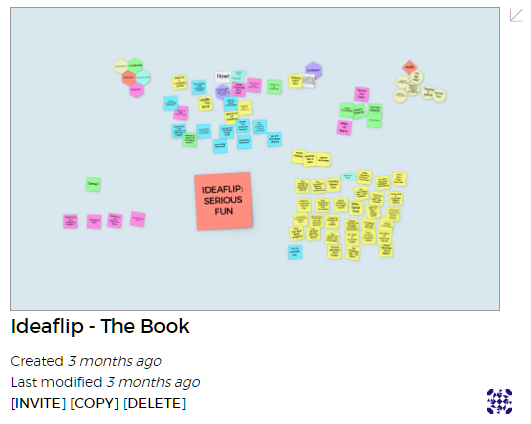 This is our favorite of the simple sticky note applications, because it's really fun to use. Colorful stickies, stickers, and shapes. Surprise tip: hold shift when you click on something to re-size or spin it around. Spinning is fun! Recent updates to IdeaFlip make it even better. New features include an in-meeting timer (super helpful for keeping those brainstorming sessions on track) and a way to lock the board, which reins in the chaos. Finally, the "Follow Me" feature lets the meeting leader control which part of the board participants are viewing. This solves the annoying challenge of trying to get people to follow the conversation; no more of the "No, Jim. In the bottom left corner. Scroll down. You have to use your mouse," back-and-forth. 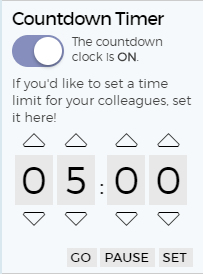 Screenshot: Setting a timer for an IdeaFlip session. We've participated in online innovation games in the past, and know that theoretically, you could configure one to support our test process. They've since become one with Conteneo, which has a very clear Enterprise focus. iObeya helps organizations who already practice visual management take their visual boards online so they can be shared across locations. A program manager at a local agile development shop pointed us to iObeya, and asked for our opinion on whether it would be a good tool for managing retrospectives. It could be, but this is not a tool for casual use. This is big, powerful software that you should use to enhance your meetings if you have it. In general, though, this isn't a first choice for businesses or teams who are still figuring out how they want to operate. In the past year, iObeya added support for brainstorming and voting, making it now possible to fully support the KJ technique using this software. iObeya now enables collaborative creativity sessions. As the session leader, you can set the duration for the brainstorming and voting sessions, and actively participate throughout them. Because iObeya doesn't assume you'll do all your brainstorming and voting in real time, all participants are notified when a voting session is starting soon, and when it ends. While we don't recommend iObeya as a first choice for groups looking to run a strategic planning or other one-time workshop, iObeya is one of our top recommendations for groups looking to run Dan Prock's Value Stream Mapping workshop with a remote team. Also, check out this sweet demo video. iObeya is not just for large organizations! While it was conceived with large organizations in mind, it can be run as single virtual room on a dedicated server for a very reasonable per-user price – far less expensive than some of our competitors. There are surely economies of scale for large organizations, but we have been working hard to make iObeya affordable to smaller teams as well. We put Lino in the “simple stick-note” category because it didn't have obvious support for grouping or voting, but that categorization is a bit misleading. 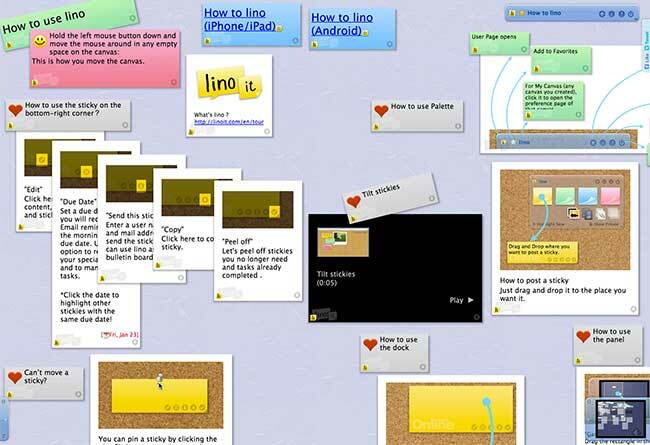 Lino's virtual boards can include all kinds of rich media and layers, and we actually found it a touch overwhelming. Screenshot: The tutorial board for Lino.it. 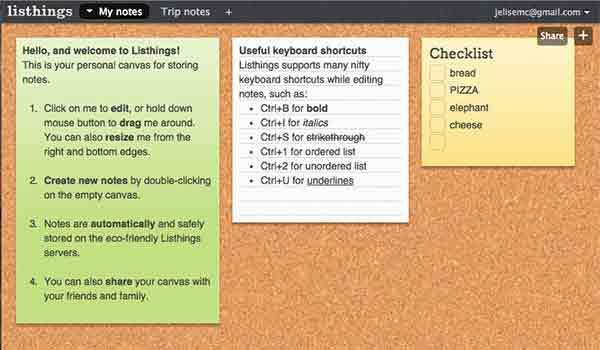 Listthings says it's “THE drop dead simple web app for taking sticky notes”. True that. The app is clean, free, and simple to use, and could be interesting to someone who wanted a sticky-note-looking replacement for Evernote. While you can invite people to a board, there was no simple invitation link option, and no support for the group or vote parts of our test process. Consider this for personal use, but look elsewhere for tools to use in your meetings. Screenshot: This is the tutorial board; we didn't run through our test process with this one. MeetingSphere crushes our test process and many other similar decision making processes. We found the software feature-rich once we finally made it through the free-trial gauntlet. (Wow, that's a lot of questions!) But the look is dated, and the messaging oddly awash in computer-speak. Meeting leaders will want to run through the tutorials; participating is straight-forward. In fact, MeetingSphere reports that participation is so easy for most teams that a small group can produce 150+ ideas in 5 to 10 minutes in the software, which makes their intuitive support for grouping and prioritizing a must. With updates and perhaps a team-oriented subscription option, we'd add MeetingSphere to our recommended list. Screenshot: The participant's view in MeetingSphere shows a big box for entering new ideas, and simple folders for grouping. MeetingSphere includes template management. Templates are available to either all other Hosts or specific Hosts. Templates are an excellent way to share and embed best practice. Most organizations already have telephone and/or video conference facilities. MeetingSphere session invitations are via a URL/link which has several levels of security a Host can add. MeetingSphere also supports direct invitations to individuals via personal password protected invitation. MeetingSphere Hosts can also embed their conference dial in details to their Host profile and automatically send dial in details with the invitation, something which also can be sent as a calendar invite. High quality audio/voice communication is all one needs to leverage the efficiency and productivity gains possible with MeetingSphere in a virtual setting. Screen share is often clunky, requires downloads and adds very little to the productivity of a conference call. If the presentation is focused on stimulating discussion and questions, the MeetingSphere tool allows commenting during presentations so no idea or question is lost. MeetingSphere participants contribute simultaneously or asynchronously. There is a setting for either ‘you see all’ or ‘you see only your own’ to accommodate the initial undistracted personal idea generation. MeetingSphere customers very often benefit from the power of anonymity, whereby people say what they think and the ‘real issues/best ideas’ are thus revealed much faster than in conventional processes (including post-its). The speed and originality of ideas flowing in the screen is very dynamic and engaging, whether face to face or on line. Of course the automated reporting through MeetingSphere also avoids the onerous task of writing up ‘the post-its’, making sense of the process steps and creating a report that is recognizable to the participants. We know that engaged participants who ‘feel’ part of the process have deeper buy in to the outcomes and are more likely to pick up the actions/outcomes they own and complete them. Our philosophy “Engage, Align, Achieve” permeates everything we build in MeetingSphere. MeetingSphere allows verbatim session reports to be produced in either Word or pdf at a click. In addition, the content of any tool can be exported to Excel. MeetingSphere focuses on meetings from 5 to 30 people, even though MeetingSphere is also used to run much bigger events and conferences. Customers are using MeetingSphere for ad-hoc calls and workshops, highly structured processes (through templates) and in large events. MeetingSphere’s Instant Brainstorm/discussion/vote can be setup in minutes, embedding best practice in a template that shares the expert knowledge to many more in the organization, cascading best practice far often far quicker than training programs. It is true that MeetingSphere (version 3.0) currently has limited 508 support. However MeetingSphere customers regularly accommodate specific needs of participants by adding voice support, language translation, “buddy support” for sight challenged participants and so on. These accommodations are routine in organizations that regularly support f2f or distributed meeting participants with disabilities. MeetingSphere 4.0 will be based on HTML5 and be 508 compliant. See the example setup for Google Docs above, and copy that into your online Word document to get started. Sorry, no screenshot for this one. When I clicked to read the help, all my changes went away, and I'm not doing that again. Mural.ly was our favorite of the big concept design tools. 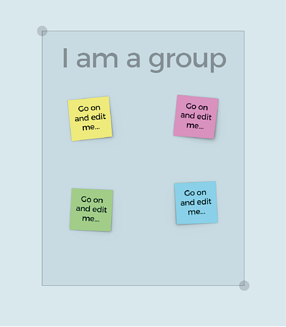 When we tested our brainstorming process, we found you could select multiple sticky-notes at once and move them together - very useful in the grouping step, and not something most of the other tools supported. They also have built-in support for dot-voting. Those of us with experience using tools like PhotoShop found the interface very intuitive. Our non-designer colleagues had a bit more trouble getting oriented, but still found this to be easier to use than some of the other products in this category. NoteApp saved all our changes (see Note.ly)! 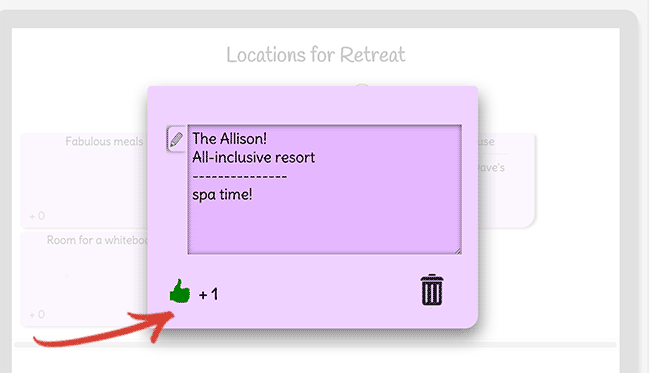 There's no support here for anything but adding stickies to a board, so if you wanted to use this in a meeting, you would need to copy & paste to group items, and find a way to mark your votes. 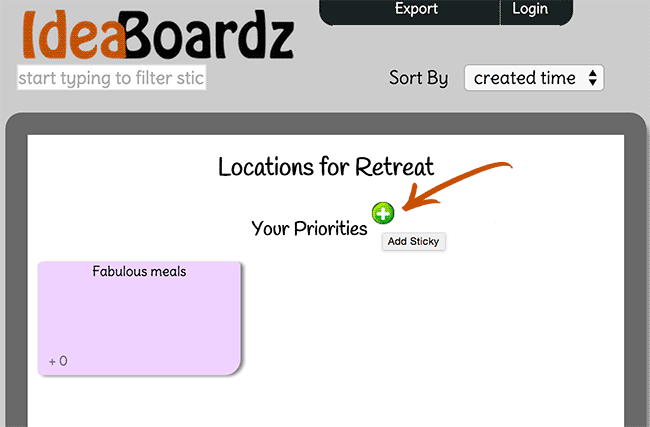 Team sharing, more than one board, and advanced options are only available with a paid subscription. You can see a screenshot here, or follow this link to play with a live version of this test board. 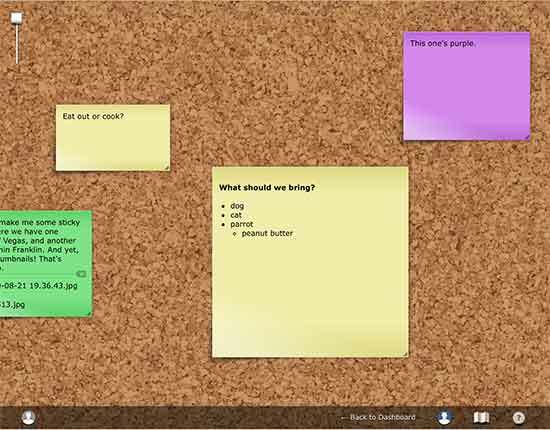 Screenshot: NoteApp's clean and simple sticky note board. Padlet is packed with clever touches. You can share each pad with your team, and the “Jetpack” upgrade looks like it adds all kinds of bling. That said, there's no process support here that would help you run through brainstorming and decision making in a meeting. Here's a public link to our test board, which you can see in the screenshot below. 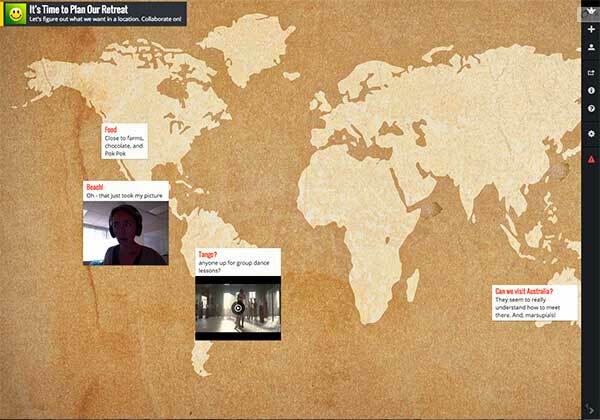 Screenshot: Pictures and notes on a Padlet board. Powernoodle provides decision support architecture to enterprise companies. In a recent demo, we confirmed that you can indeed use Powernoodle to easily run the KJ technique described above. Powernoodle walks groups step-by-step through a tailored decision making or stakeholder engagement process. The interface for participants is drop-dead simple, and facilitators get detailed reports in multiple formats. Powernoodle is more mature and more powerful than our top recommendations, supporting a richer variety of decision making techniques. This platform is enterprise grade and enterprise priced, working beautifully both before and during meetings so teams can keep meeting time focused on discussion. Organizations operating at a higher level of decision making maturity, or in high stakes environments like finance and health care, should consider adopting a tool like Powernoodle to improve the quality of decisions across the enterprise. Quip provides elegant, mobile-friendly co-editing and collaboration. Of the co-editors on our list, Quip has the prettiest UI, the most understandable folder structure, and the slickest integration of task lists, spreadsheets and rich media. That said, it seems this was the only co-editor that didn't have obvious accessibility support. To use Quip for brainstorming and decision making in a meeting, follow the steps we outlined for Google Docs. Screenshot: Adding ideas to a document in Quip. We found the infinite canvas concept to be challenging in a meeting - and hard to capture in a screenshot! It was a bit too easy for people to accidentally find themselves looking at different parts of the canvas during the discussion. We have a Screen sharing mode (in Premium and Team accounts), that allows you to demonstrate the screen during the meeting and avoid misunderstanding when looking at the board. In the near future we are planning to show other participants' cursors, so you'll never get lost on the board. Retrium is intended specifically for supporting retrospectives; meetings which happen to rely on the process described in our test. The product is pretty new, and it lacks both a grouping feature and the configurability we'd need if we were going to use it to plan our company retreat. No fault there - they don't claim to support anything beyond a growing set of pre-defined retrospective techniques. If you need a tool specifically for retrospectives only, keep an eye on Retrium. It's a promising start. Screenshot: Voting on ideas using Retrium's Like, Learned, Lacked retrospective template. Retrium has come a long way since you reviewed it on your site. We now have grouping functionality. We now have action plans. Something unique to Retrium is the flow from retrospective to action plan and back again. In other words, retrospectives lead to the creation of action items, but then in your next retrospective, you start with your existing action plan rather than from a blank slate. As such, Retrium action plans are living documents as opposed to one off exports. Retrium is fairly unique in that it helps you facilitate your retrospectives. 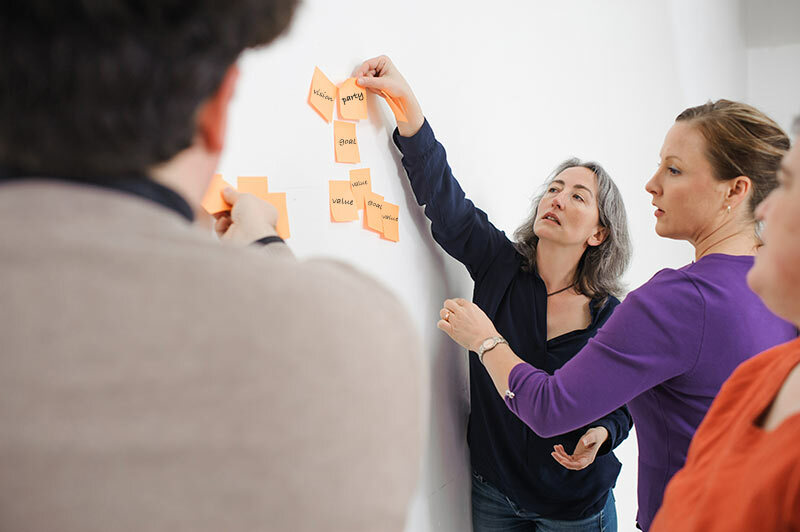 All Retrium retrospectives start with private brainstorming, move on to grouping and affinity theming, continue with dot voting, and end with prioritized discussion and the creation of an action plan. Unlike online whiteboards, Retrium isn't "freeform space". After all, retrospectives aren't free-for-alls either. Good ones have a flow to them. Retrium helps keep your participants engaged with that flow throughout the retrospective process. Stormboard supports all the steps in our process. You can use it to add notes, combine them into groups (or “index cards”), and cast votes for your favorites. They even had an event planning template we could use as a starting place! Our free Stormboard account didn't allow us to test the reports or some of the settings, and we found some features a touch disorienting, but in general it all looked promising. This tool straddles the line between products like ConceptBoard and Realtime Board, and the more process-oriented products like Lino.it and GroupMap. 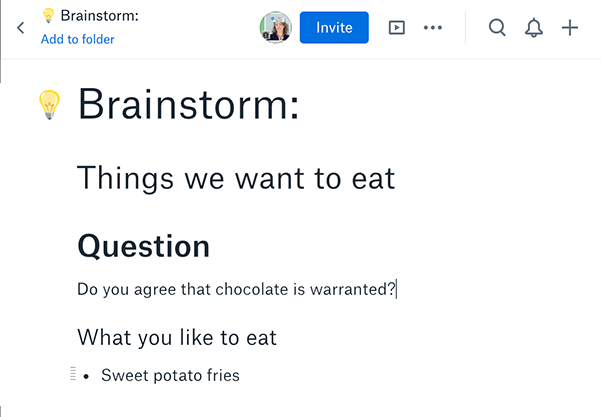 While not one of our top recommendations, Stormboard should work nicely in meetings for any team willing to spend time getting used to the interface. Update: Lucid Meetings integrates with Stormz! Now you can add and launch Stormz workshops right from your Lucid meetings to support worksops like the Strategic Planning sessions. Learn more! Stormz provides everything you need to prepare, ideate, share, vote, evaluate, wrap-up, and report on a decision making session. There's a limited free version useful for learning the system and the pre-built templates covering many common decision-making processes. The templates come with great instructions, and they're easy to tweak to match the specifics of your meeting. Stormz offers more import, export and integration options than most others, and a way to deploy the system on a local network, which is great for those times when you can't ensure a reliable or secure Internet connection. Stormz met all our evaluation criteria but one; they don't have any meaningful accessibility support. That said, only a few of the products on this list do. If that's not a big issue for your group, I recommend trying out both Stormz and Groupmap to see which you prefer. Guided Collaboration: each template acts as an integrated collaboration guide for the participants, including detailed step-by-step instructions; you can have text, images, and videos in the instructions of each step. This is especially helpful when running multi-day sessions, where participants can work on the Stormz asynchronously. Process Flexibility: contrary to most of the process-based tools on the market, Stormz does not enforce one specific kind of process. This enables you to design from the simplest to the most sophisticated sessions. So if I want to converge before diverging (and there are some use cases to that) or if I want to have 99 steps of divergence/convergence, I can do it. This is also why you can do brainstorming, design thinking, retrospective or decision making with the same tool. Idea Development: most of the other tools focus on generating and selecting ideas. The “section” feature in Stormz is a unique feature that enables to go beyond the initial idea and improve it using any kind of framework. For example, the simplest one would be Pros & Cons but you can use many others. That is also called "Greenhousing" ideas. Visualizations: the “post-it note on a canvas” paradigm is cool, but Stormz has many other views that can be used to step back and analyze the data: the bar chart (vote), the bubble chart (evaluation) and the insight cloud. Multi-language: Stormz is currently available in English, French, Italian, Spanish and Russian. New languages can be added easily. Stormz Box: a local server and wifi for in-person workshops when you need reliability (with large groups) or confidentiality (no cloud). ThinkTank supports the decision making process on a grand scale. If your organization operates at this level, you might consider whether this software could enhance your meetings. We were unable to test ThinkTank ourselves, but you can find a video demo here: https://vimeo.com/92583930, and we'll leave you with this. An invitation: Help improve these recommendations. Do you work at one of the companies listed here? Let us know if we missed something in our test that people should know. We'll happily add (and clearly label - as you can see above) any short information you send our way that will help people better understand your product's value. Know of another tool that should be on the list? We'd love to hear about it. You can contribute in the comments below, and we promise we'll update this post as we learn more! And with that, I'm off to wade through all the "Welcome to your new account" email sitting in my inbox from this test. Happy sticky-noting, everyone! Working With a Distributed Team? Do you worry that, as the meeting leader, you're not honoring both virtual and face-to-face meeting participants? This short online course may be just for you.